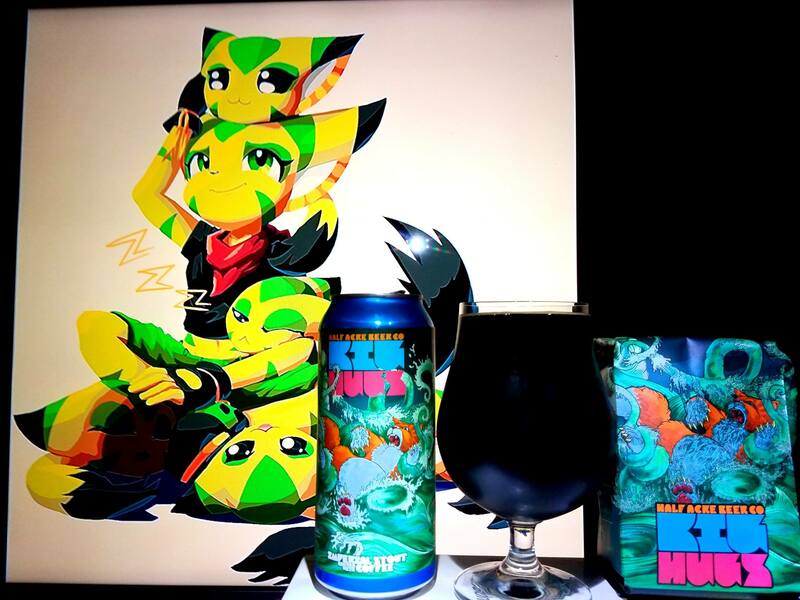 2017 Big Hugs by Half Acre Beer Company is a 10% ABV American Imperial Stout brewed with Dark Matter Coffee. 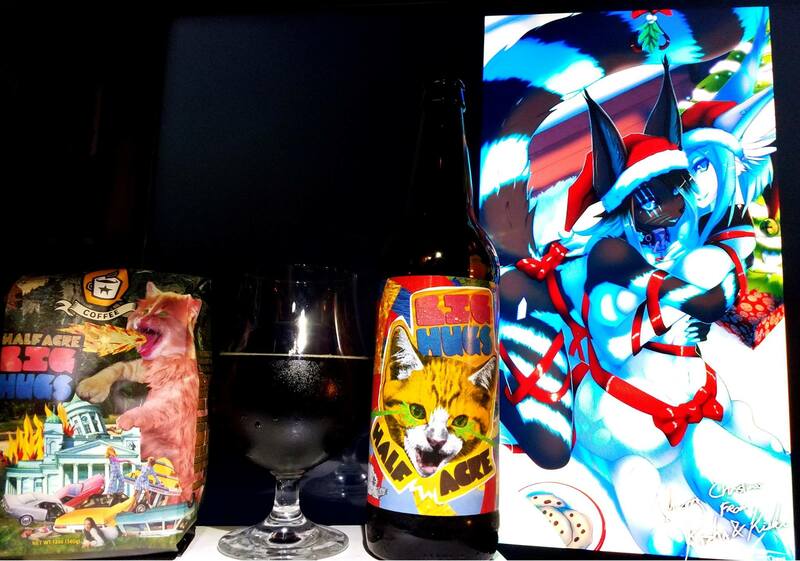 One of my favorite beers to get every year. Absosmoothitetutely Amazing!! This beer is a thug. Big and chock full of tender embrace. A specialty brew. Grab it when you see it. 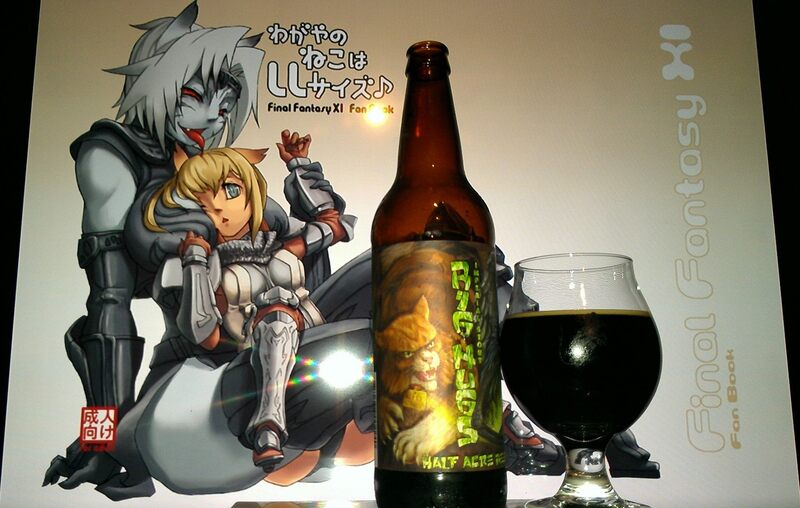 10% ABV. …Big Hugs has grappled with natural order and twisted the pillars of existence. While you hang in the balance, steal time to sit steady and spill this black rumble into your center. 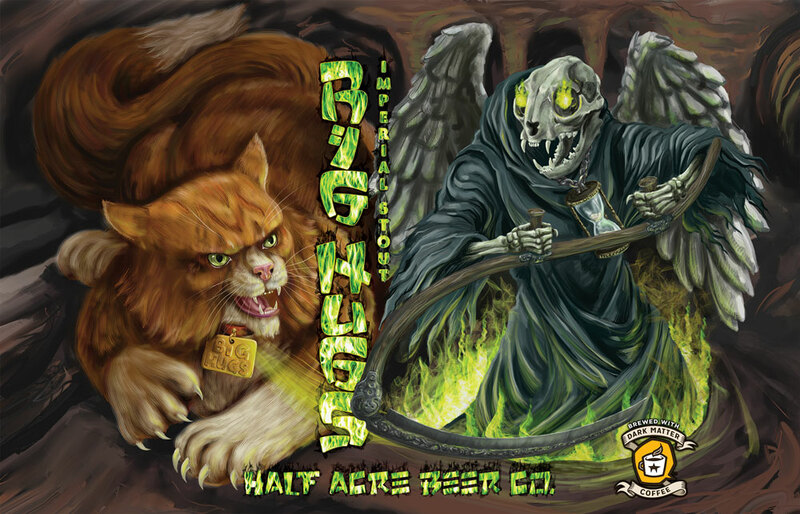 Big Hugs Imperial Stout is liquid char scraped from the bowels of eternity, soaked with the free spirit of an adolescent feline. Heed him and rejoice. The time has come to release our annual homage to the accidentally violent, disastrous fly swatter we call Big Hugs. In its 8th year, Hugs has managed to break through the worm hole and find itself up against the real monsters – human kind. As a huge fan of this crazy Kaiju Cat, I feel it is my duty every year to bring forth news of the return of a monster. A giant cat that can only suit its feels with hugging and massively destroying to the human race. Of course, he is loved by many. Who wouldn’t? Which makes me wonder how he would fare against Godzilla. To be honest, they would just be the best of friends. Who knows, maybe Big Hugs is Godzilla’s cat and no one knew it. Regardless, this one is one that you have to embrace. Take it on like a quest of dragons…err… cats. 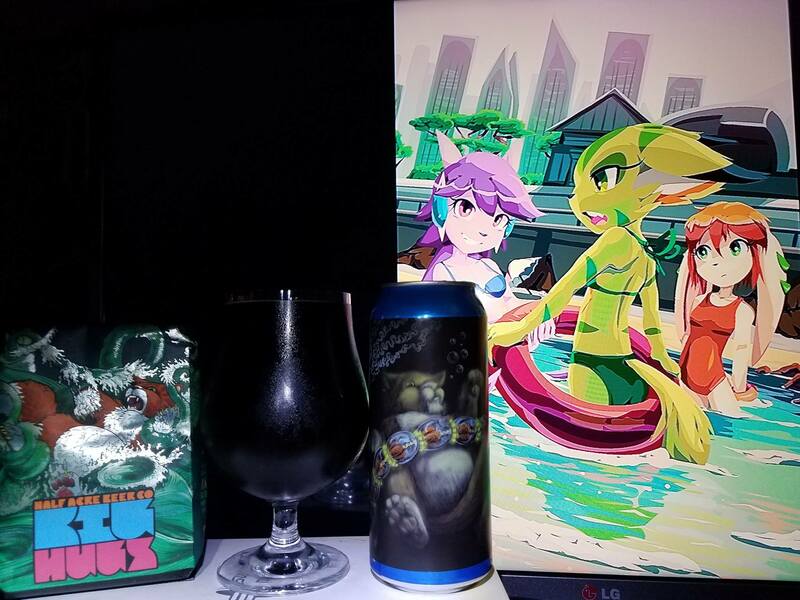 Like previous years, I hope to bring the beer to the site. Even if it is just the basic one. I think they do something different every year. Also, since I bought this years Dark Matter Coffee with Pink Himalayan Salt, I wonder if it will actually have that. 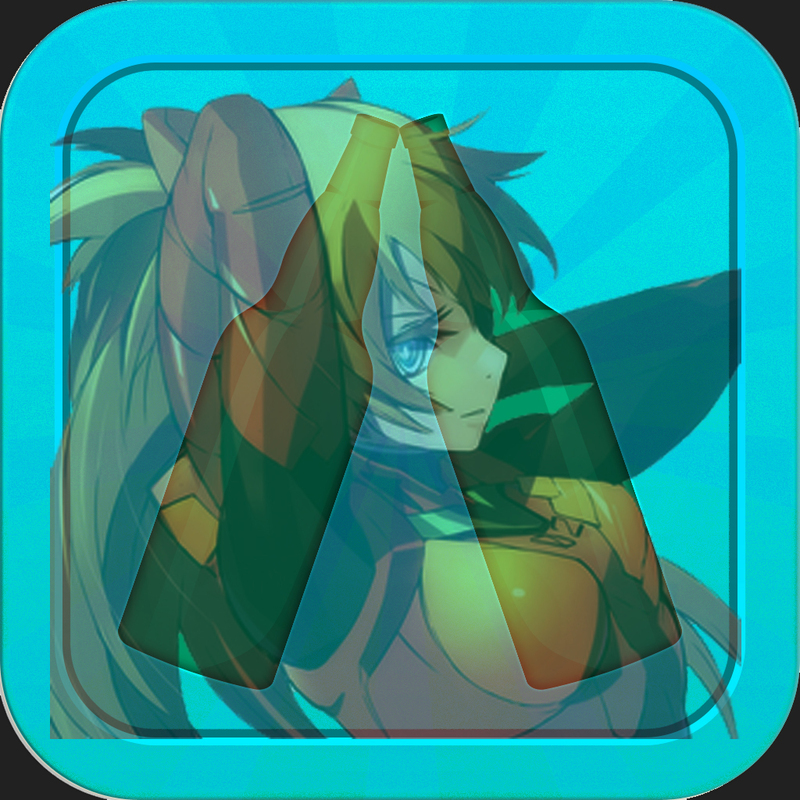 Although, there is a version like that already. Anyways, let’s take on this Catastrophe!, Cheers! Chocolate milk shake, vanilla, dulce de leche caramel, fudge chocolate, roasted coffee, mocha, fancy coffee, espresso, dark fruit raisins, plums, prunes, currants, dark cherries, blueberries, coconut hints, tobacco, molasses, anise, leather, toffee, pecan pie, mild peanut butter and banana hints. Dark Chocolate, Milk Chocolate, Baker’s Chocolate, German Chocolate, salted dulce de leche caramel, vanilla, toasted coconut hints, dark fruit raisins, plums, prunes, currants, dark cherries, blueberries, roasted coffee, mocha, fancy coffee, espresso, vinous grape notes, Kahlua Liqueur, brownies, pecan pie, bananas, malted chocolate, chocolate mousse, oatmeal cookies, smokey notes, anise, port wine, earthy notes, cookie dough ice cream, pecan pie, toffee, rock candy, salted chocolate, tobacco, leather, brown sugar, fudge chocolate, hazelnut nectar and pralines. Finishing rich with caramel, sea salt, vanilla, dark chocolate, peanut butter, Fancy Coffee roast, spicy coffee complexity earthy notes and dark fruits. 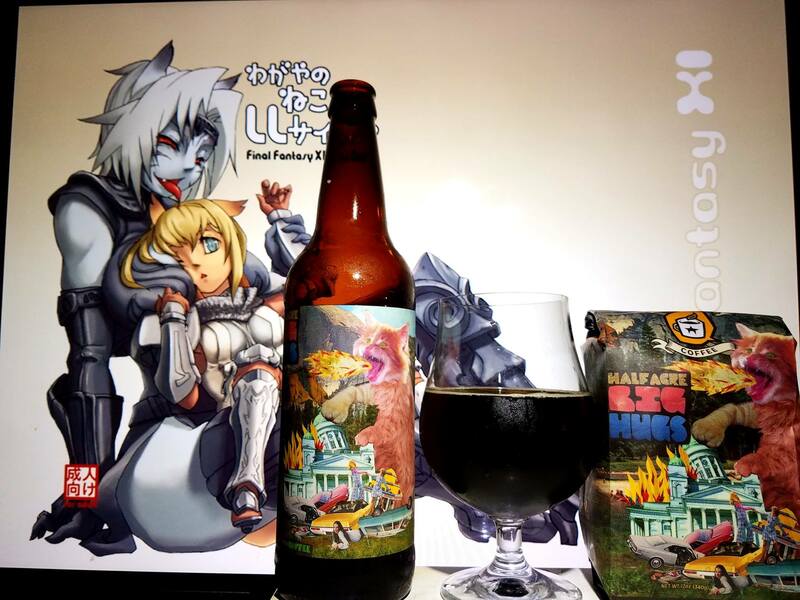 No alcohol in the taste, Dark like the abyss of nothingness dark body, Smooth, velvety and creamy mouthfeel and almost easy to drink despite the ABV. 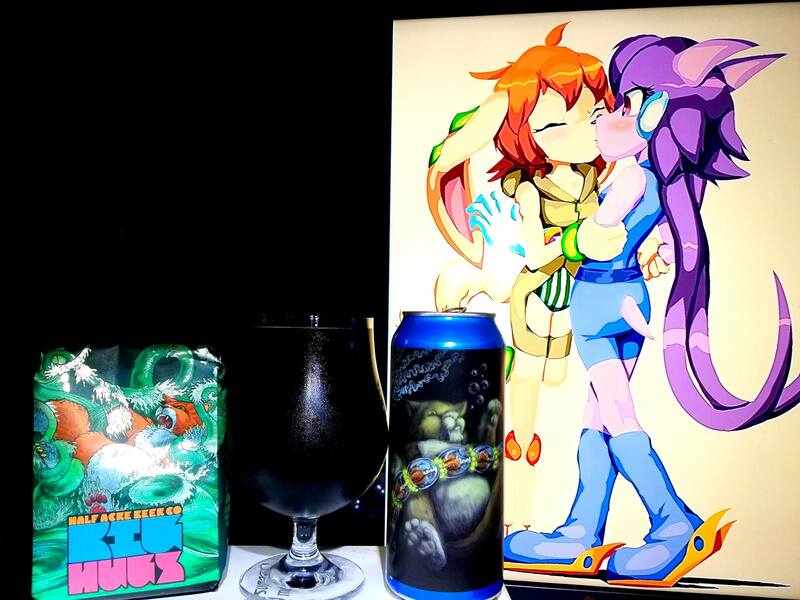 I find it very interesting that this version of Big Hugs, while very exceptional and delicious as always, it had some salty notes like that of the Salted Chocolate version of the beer. It is interesting because the actual coffee does have Pink Himalayan salt, yes, the little baggie in the pictures. Makes wonder if they did use the same coffee as they did in the past years or if this is a new blend. 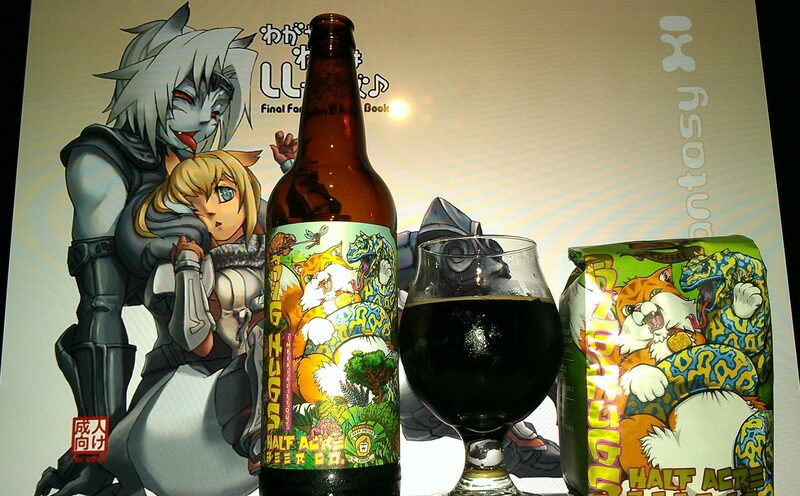 Needless to say, still one of my favorite beers and the salty notes surely does add some complexity to the beer. Now while I did love this one, I am sure the variants are even better ofcourse. This one should still be seeked though as it is the original. 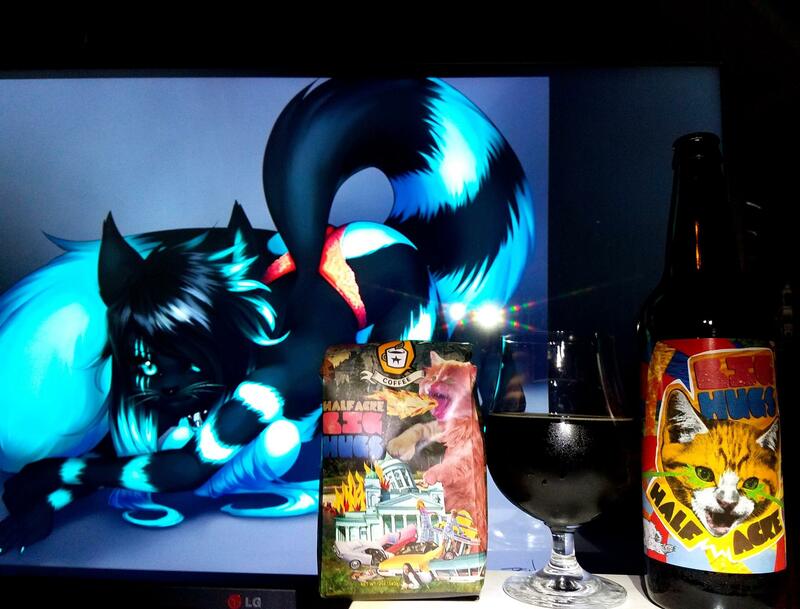 Here watch this Cat Video from them to find out why you need this beer in your life. LOL Cheers! Big Hugs from Meredith Anderson on Vimeo. Ark Angel MR or evil Mythra from Final Fantasy XI was used in this pairing as I used her in the last pairing. The original idea had to do with the whole Big Hugs. Since she is a gray cat lady with crimson eyes, it would have fit with the Mecha Hugs Label from back in the day. The fact that she is an Ark Angel, she fits even more perfect with the evil Big Hugs and the whole Big Hugs as she squeezes the orange Mythra representing the colors of the original Big Hugs cat. I also included original character Kisha the furry cat (character created by Kisharra of DeviantArt.com) as her color represent Christmas. 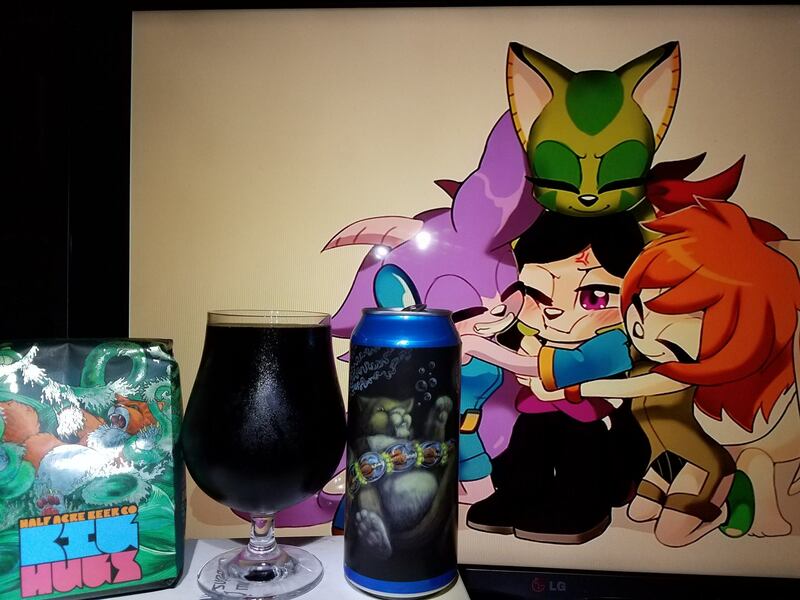 This beer is released for Christmas so I figure this would work out since I found a picture of her hugging another furry cat on Christmas. Also, with that sensual stare, who wouldn’t want to hug up against a warm cat. 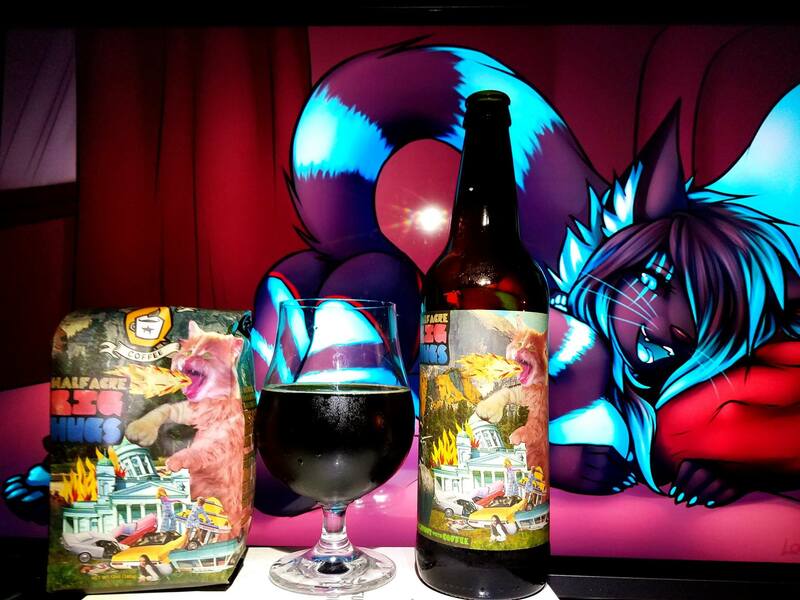 Ofcourse, just like Big Hugs, big cats in real life are dangerous, just like the ABV on this one. Another year, another installment of the great and mighty Big Hugs. Every year since I first had it I have tried to get a hold of this one. 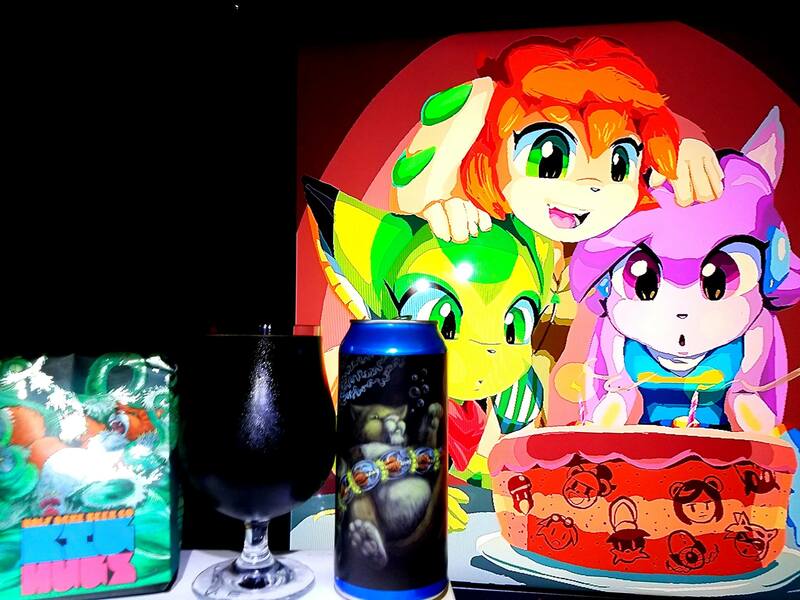 I have missed some installments in the past but each year is something different but similar to the previous beer. Big Hugs the Cat started off with hugging giant buildings but he moved on to hugging other things and having to fight other giant monsters. This time, a giant snake. 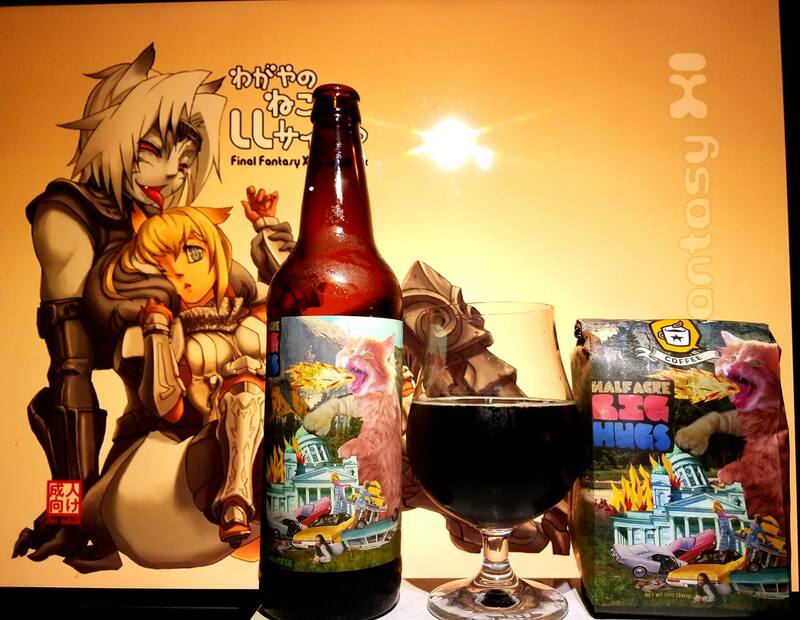 Since they released the beer, Dark Matter also released a special Coffee as well which are the coffee beans that were aged in the same beer. Essentially, more ingredients for future beers. Anyway, let’s have a look at this, cheers! Rich mocha, Fancy roasted coffee, espresso, Vanilla, Caramel, Milk Sugar, Milk Chocolate, Dark Chocolate, bakers chocolate, German Chocolate, brownies, peanut butter, pecan pie, rock candy, toffee, Bananas, clove spice, vinous grape notes, dark fruit raisins, plums, prunes, currants, coffee cake and pecan pie notes. Rich Vanilla, Caramel, Milk Sugar, Milk Chocolate, Dark Chocolate, bakers chocolate, German Chocolate, Mocha, Fancy roasted coffee, espresso, vinous grape notes, java, Kahlua liqueur, Dark fruit raisins, plums, prunes, currants, dark cherries, blueberries, brownies, peanut butter, pecan pie, rock candy, toffee, Bananas, clove spice, herbal notes, tobacco, leather, smokey notes, walnuts, pralines, cinnamon, earthy notes, oatmeal cookies, cookie dough ice cream, anise, port wine, vinous grape notes, chocolate fudge, cherry and coffee cake, chocolate mousse, malt chocolate and coffee milk shake. Finishing rich with vanilla, caramel, chocolate, peanut butter, Fancy Coffee roast, spicy coffee complexity earthy notes and dark fruits. No alcohol in the taste, Dark like the abyss of nothingness dark body, Smooth and creamy mouthfeel and almost easy to drink despite the ABV. 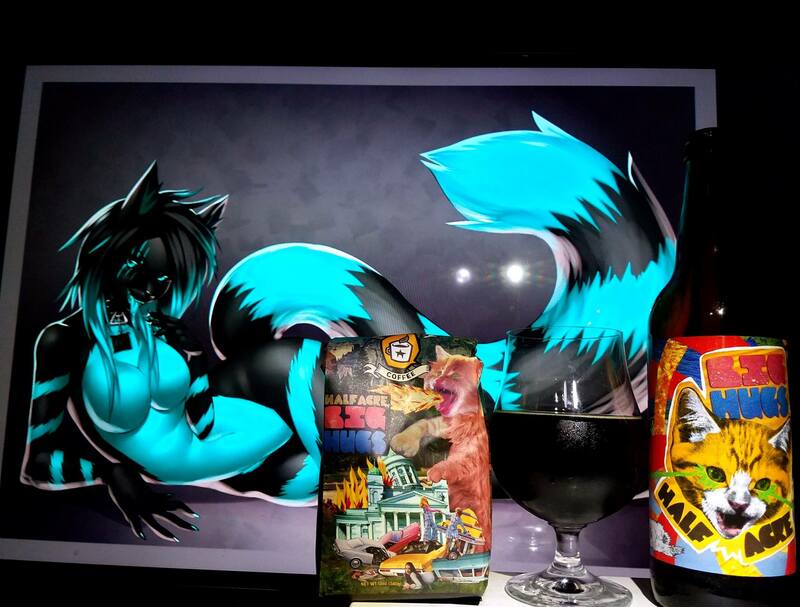 What can I say about this beer that I have not mentioned before. 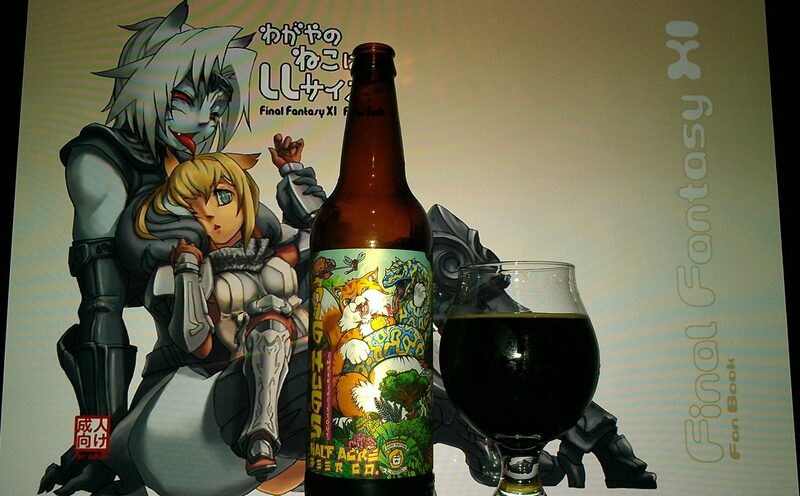 There is a reason I get this beer every year and even implemented dark matter coffee into my homebrews. Their stuff is the stuff of craft beer legend. With the recipe using the Coffee, it elaborates so many deep dark complex, fruity yet chocolatey, caramely and other sweets of the sweets goodness. As every year I try this, I highly recommend it. Ark Angel MR or evil Mythra as well as Dragoon Mithra from Final Fantasy XI was used in this pairing as I used her in the last pairing. The original idea had to do with the whole Big Hugs. Since she is a gray cat lady with crimson eyes, it would have fit with the Mecha Hugs Label from back in the day. The fact that she is an Ark Angel, she fits even more perfect with the evil Big Hugs and the whole Big Hugs as she squeezes the orange Mythra representing the colors of the original Big Hugs cat. 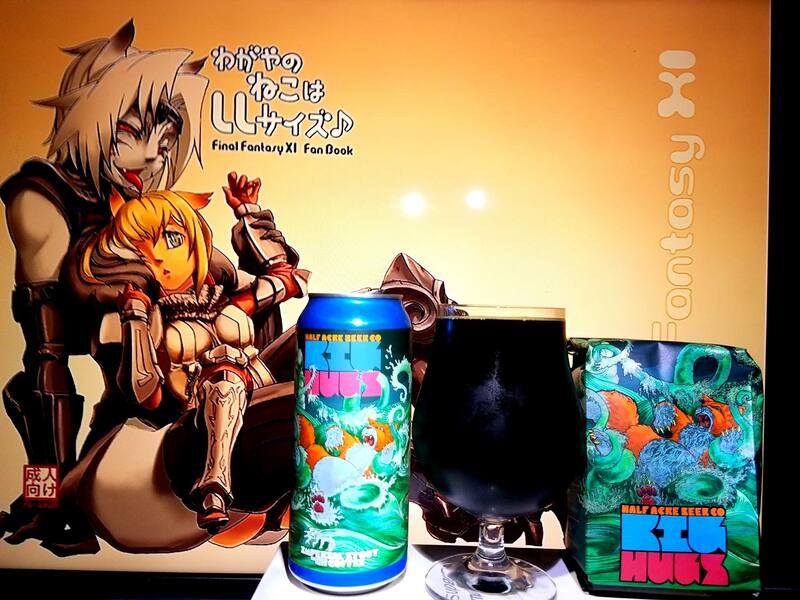 This beer as you stare at the dark yet determined Dragoon Mithra which represents victorious version of Big hugs in the under label, she wears that Snake like it was a dragon armor… a victory well suited. This is the second time I try this beer and this time it is at its freshest. Thanks to www.mybeercollectibles.com for helping me obtain this one as this one is nowhere to be found here in California. 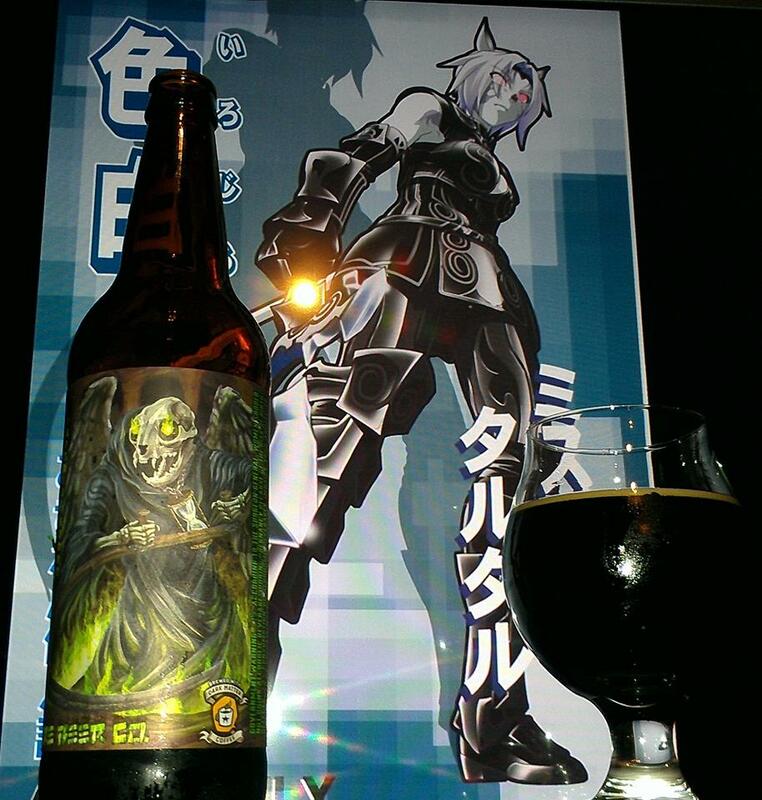 Although, from what I remember in the last time I reviewed this beer, it was awesome aged. 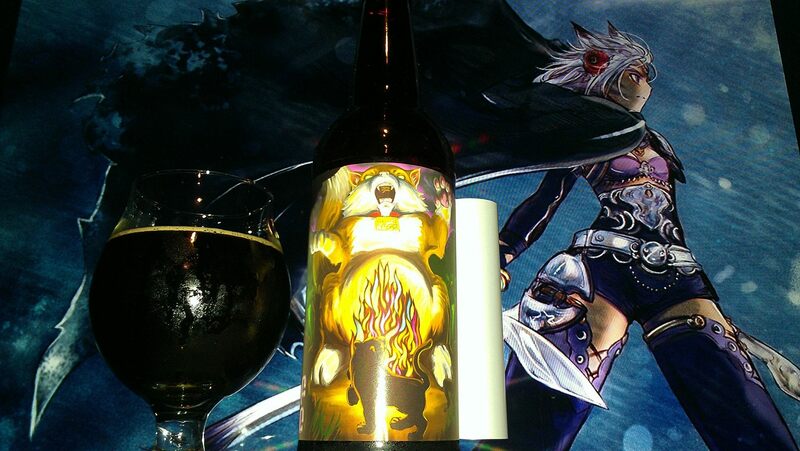 This beer is still hard to find unless you live near Chicago or can trade for it. Either way, let us see how well the fresher one does here. Fancy roasted coffee, espresso, Mocha, Java Kahlua, vinous grapes, dark fruits like raisins, prunes, plum hints, dark cherry, blackberry, currants, deep dark chocolate, hazelnut nectar, rock candy, Danish Cookies, oatmeal cookies, spices like ginger, herbal notes, brownies, peppercorns and tobacco. Mocha, Fancy roasted coffee, espresso, vinous grape notes, java, Kahlua, caramel, vanilla, dark fruit raisins, plums, prunes, hazelnut nectar, dark chocolate, milk chocolate, bakers chocolate, molasses, walnuts, pecan pie, toffee, brownies, rock candy, peanut butter, Danish cookies, oatmeal cookies, peppercorn, tobacco, leather, smokey hints, brownies, spicy notes, herbal hints, complex coffee notes, earthy notes, dark cherry, black berries, and prailines. Fancy Coffee roast, spicy coffee complexity earthy notes, caramel, dark chocolate and vanilla. No alcohol in the taste, Smooth and creamy mouthfeel, almost easy to drink despite the ABV, Dark like the abyss of nothingness dark body. Damn, every time I try a different roasty variant from different companies such as Dark Matter or Portola Labs, they always have some really complex stuff. Like the fact that the coffee world is on its own level, just mixing it with some of these beers makes them that much more complex. 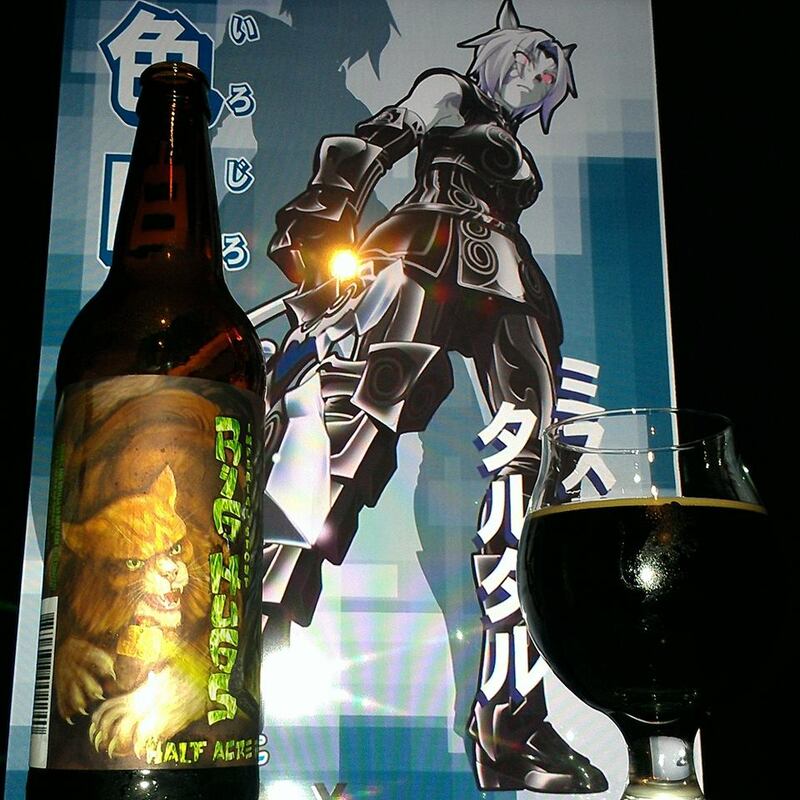 Also the fact that this makes this one is just that much of an exceeding expectations kind of beer is just phenomenal. I really think the fresher the beer is better as you get more of the coffee complexity than what I did with the 2 year aged one. It is rather strange but I really feel like this was the case with this one. Ark Angel MR or Evil Mythra from Final Fantasy XI was used in this pairing as I used her in the last pairing. The original idea had to do with the whole Big Hugs. Since she is a gray cat lady with crimson eyes, it would have fit with the Mecha Hugs Label. The fact that she is an Ark Angel, she fits even more perfect with the Cat Angel of Death and the whole Big Hugs as she squeezes the orange Mythra representing the colors of the original Big Hugs cat. 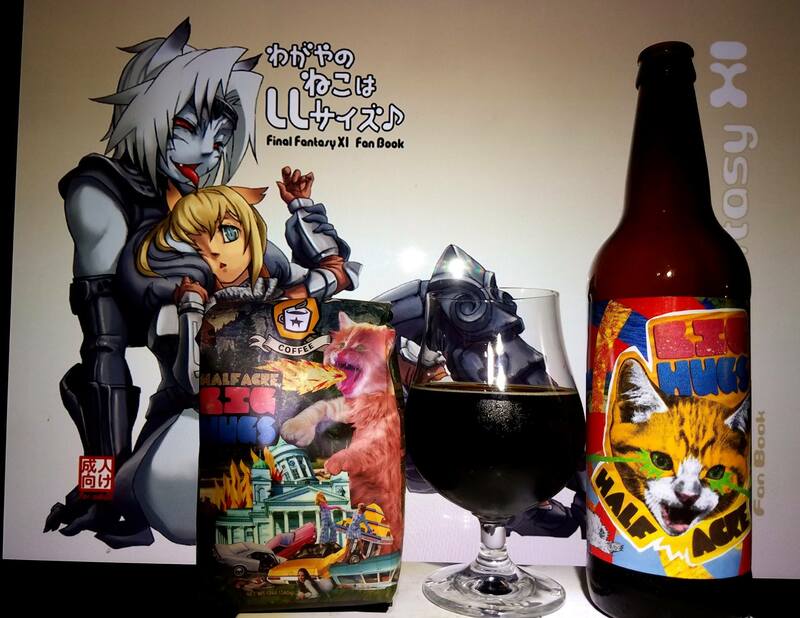 This beer is evil, Feline Evil. Just like the surprise toy in the cereal boxes or the special prizes they have on those McDonalds cups, Peel the original label to get so much Win in this awesome label behind the Original. Yeah I really didn’t catch this until later. YAY BigHugs!! See, Ark Angel MR and regular Mithra are great friends!